The site is nearby the cliffs of Arbel with a view that opens to the Sea of Galilee. However, this view is blocked by a row of houses on the other side of the street. Because of this, the main (living) floor of the home is higher then the entrance level. Also, the orientation of it was rotated so that the perspective view opens diagonally to the mountains through the two rows of houses along the street. The rest of the rooms of the house are located at half level beneath and above the main floor. 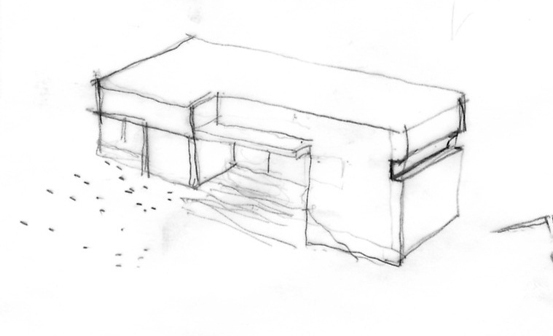 This gives the possibility to use this house in different ways; two units (beneath and above) with a central part in the middle (living) level, or a working space for the lower part. Using the split level scheme opens up the public space from the street up to the roof (balcony) which can be used as an open (green) balcony opening up to the whole view. The entrance hall becomes a path which connects the front garden with the back garden. Above this path are the central stairs in a vertical (central) space which is a source (northern) to light the whole building.